Some modules are actually integrated within the core or basic modules, for example, the Enhanced Quality Assurance module will appear embedded within the standard Quality Assurance module. To the left is a typical Menu Screen for the Sales Management module. Customer Relationship Management (CRM) is first a marketing tool. You develop your campaigns in CRM and track them from through the campaigns’ events, activities, and culminating with the leads generated from this lead generation process. With the lead/prospect in hand, CRM manages your entire sales process using Epicor tools, like, workflows and forecasting. The Sales Manager uses CRM to guide their sales staff through the quoting and sales processes. Once a lead/prospect is generated, they are assigned to sales staff based on territory and region. Once the lead/prospect is assigned, the salesperson is guided through the sales process using CRM task lists. It is the Sales Workbench which your salespeople will use to manage the prospect-to-customer-to-quote-to-sale lifecycle. Case Management provides call management from the first call to final resolution and follow-up. The Case Management module provides your organization with personalized, high-quality customer service. This comprehensive module enables your service team to manage their current case load and respond quickly to customer issues. This module includes a Case Workbench that contains time saving links to customer-focused activities like new quotes, orders, RMA requests, or service calls. It also contains a workflow you leverage to standardize how you resolve customer cases. Use this functionality to dispatch field activities and give your field service representatives access to online knowledge such as existing customer field service calls, warranty information, and service contracts. Quote Management through the Opportunity/Quote Entry utility. If the company requesting the quote is not in your database, then the lead/prospect is created using Opportunity/Quote Entry. If the lead/prospect accepts your quote and issues you a purchase order, the lead/prospect will automatically be redefined as a customer. With you quote accepted by your new customer, you have the ability to “push” your quote information into your Sales Acknowledgement (sometimes called a Sales Order). If CRM is enabled, you would mark the quote as “won” and this would automatically generate a sales order. The typical quote will have header information, and at least one or more quote line items which contain the parts and quantities requested to be quoted by the lead/prospect or customer. Once the quote line information is created, the quoter has the opportunity to create the manufacturing for each part. This information which includes estimated material, subcontracted services, direct labor, and burden required to make the part. These costs then can marked up based on several options. A typical mark-up is based on your company’s gross profit margin goal. This gives the quoter and/or salesperson a benchmark from which they can make a business/sale judgement. Without this pricing benchmark, you are quoting in the dark. Demand Management is intended for the management of both your short and long-term contracts with your customers. The Demand Management module will convert the contractual customer demand of your into sales orders and demand forecasts. With Electronic Data Interchange (EDI), you can manage your customers’ demand contracts by passing information electronically both to and from your customer trading partners. It is through the Customer Maintenance tool you associate the customer’s “trading partner identification number” and define how inbound and outbound transactions are to be processed. You manually use the Demand Entry or Demand Mass Review to review the demand lines and shipping schedule, while evaluating their impact. After evaluation, you can reject and select the schedules for transactional processing. Once you have modified the schedule, you then process the demand which automatically creates firm sales order releases, unfirm releases, or demand forecasts. 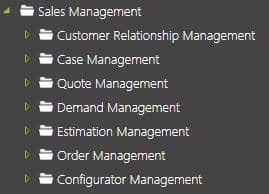 Order Management through its Sales Order Entry utility you can create and structure your sales order acknowledgements to accurate reflect your customer purchase orders: single release sales orders to complex, configured, kitted, multi-line, multi-release orders. When necessary you can always change all aspects of the sales order, designate a line item is make-direct or buy-direct, allocate inventory, drop ship, and using the Order/Job Wizard, automatically create jobs from the order’s detail lines. When using the price and discount functionality, you can apply your price breaks across your product lines or individual price breaks to specific customers. With the Sales Kit function, you can create a sales kit for a part that contains any number of related child parts.